A commuter plane that smashed into a house was pointed away from the airport it was trying to reach, investigators said Saturday, noting that it apparently fell flat. Flight data showed the plane's safety systems warned the pilot that the aircraft was perilously close to losing lift and plummeting from the sky. 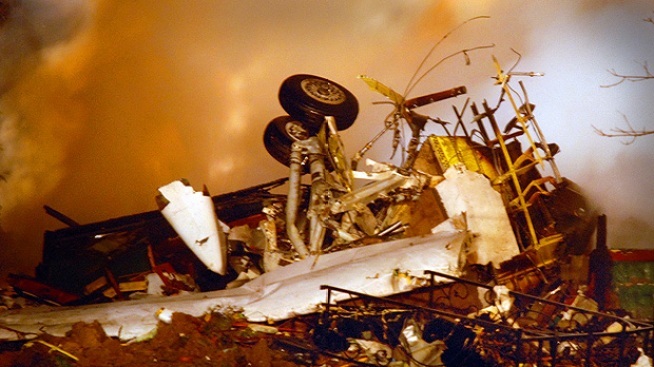 The ensuing crash killed 49 people on the plane and one in the house. Continental Connection Flight 3407 didn't nose-dive into the house, as initially reported by some witnesses, said Steve Chealander, a National Transportation Safety Board member. “Keep in mind, there's an airplane that fell on top of a house, and they're now intermingled,'' he said. The plane -- on its descent to Buffalo Niagara International Airport in a light snow and mist -- plunged suddenly about six miles shy of the runway and exploded. A “stick shaker'' and “stick pusher'' mechanism had activated to warn Capt. Marvin Renslow that the plane was about to lose aerodynamic lift, a condition called a stall that means there's not enough air under the wings to keep the plane elevated. When the “stick pusher'' engaged, it would have pointed the nose of the plane toward the ground to try to keep air under the wings, the last moments before it stalled and plunged to the ground. Crash investigators picked through incinerated wreckage Saturday, gathering evidence to determine what brought down the plane. Icing on the aircraft is suspected to have played a role, but officials have stopped short of calling that the cause. Experts were analyzing data from the black boxes, including statements by crew members about a buildup of ice on the wings and windshield of the plane, Chealander said. DNA and dental records will be used to identify the bodies, he said. One aspect of the investigation will focus on the crew, how they were trained and whether they had enough time to rest between flights. Other investigators focused on the weather, the mechanics of the plane and whether the engine, wings and various mechanics of the plane operated as they were designed to. Initial visual inspection of the engines indicates they were working properly, Chealander said.